We all have been in a position where you need to get a friend a gift for birthdays, or for Christmas, but don’t want to spend too much money. The guys at Vantecusa.com sent a perfect gift for any computer guy/gal. 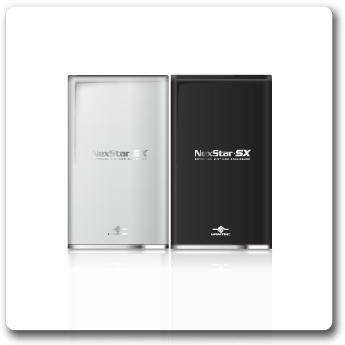 It is the NexStar – SX, a small USB 2.0 hard drive case. The hard drive is not included, which allows the receiver to use any IDE or SATA drive from a retired laptop. Since the case didn’t come with a drive the cost not something that will break your budget. I picked up a portable drive some months ago and to this day, I use it every day. Since the drive is larger then any USB thumb drive, it can hold a lot more data. Also due to its size, it can be carried in the smallest of bags and no need to carry an additional power supply since it uses only USB power. One other major use is the ability to pull a drive from any laptop of the same type (IDE or SATA) and drop it in the case and plug the case into another computer in about 5mins or less to pull vital data from the drive is priceless in the I.T. field. Now there are many other uses or scenarios to put into this review, but at least you get the idea of a few uses. The NexStar-SX comes in two flavors, SATA and IDE. Of course IDE is the long used type of laptop hard drive available on the market today, so finding a new 2.5” drive with a lot of storage space at a reasonable price will be very tempting to pretty much everyone. Also there are many of you who purchased a second drive for a laptop at one point in time and maybe you are not using it anymore. The drive may only be 40 Gigs, but it is still bigger then the largest thumb drives on the market at the time of this review. The other option is 2.5” SATA drive which are coming available to the market at the time of this review and have much more storage capacity then IDE drives. This technology is somewhat new to the laptop arena and a cost of a new drive is a little more then most people want to spend (today). So those of you who have upgraded your laptop’s SATA drive to another and have the old one just sitting around, for a few dollars you could pick up one of these cases and put that drive back to work. Also since both drive cases will be connecting to your PC via USB 2.0, opting for SATA over IDE will not be worth the extra expense.